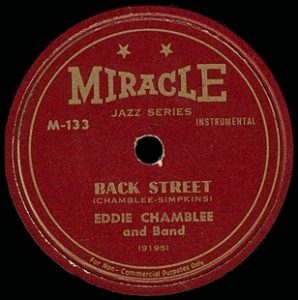 In January 1949 – following a year in which Eddie Chamblee went from a virtually unknown session musician to the cornerstone of two #1 hits of 1948 including the single biggest hit of the entire year, playing saxophone behind pianist Sonny Thompson – the black newspaper The Chicago Defender cited Chamblee, who was now heading up his own band, as a leading proponent of “rockin’ rhythm”. But while the description that Chamblee used to describe his style was indeed an accurate one it was also at risk for becoming an outdated one for him as more and more horn blowers were encroaching on his territory and rapidly expanding the possibilities. Chamblee, never the most unhinged player to begin with, was apt to be left behind should the groove-oriented style he specialized in continued losing ground to the more flamboyant honking and squealing displays of those who followed in his wake. We weren’t to that point yet – not when Paul Williams was dominating the field with the comparatively mellow groove found in The Hucklebuck – but that record aside the trend was definitely starting to favor the more rambunctious players. So for Eddie Chamblee, who had of course been mentioned on the labels of Thompson’s hit records as well as in the trade papers so that his name was not unfamiliar to the masses, he needed to stake his own claim for an honored spot at the head table while there was still room for him before the entire affair turned into a wild free-for-all. It’s important to remember that Chamblee and Thompson were never members of the same self-contained band. They were both sessionists and while Thompson DID have a band he did club work with they weren’t the same cats who he cut those sides with in the studio, the wonderfully named The Sharps And The Flats. Chamblee wasn’t sharp OR flat, or rather he wasn’t a part of that outfit either. He’d been recruited to add his horn to some tracks behind vocalists for Miracle Records in the fall of 1947 and therefore was merely supplementing Thompson and the others. With time left over on a session date Sonny Thompson along with The Sharps And The Flats revisited an instrumental they’d laid down a few weeks earlier and with Chamblee adding a beautiful counterpoint on tenor sax the song, Long Gone – already very good to begin with – became great. The two versions were released as Part One and Part Two on the same single and soon was the #1 hit in the land… in fact the biggest rock hit of all of 1948. Of course Miracle dug through their remaining sides Chamblee had cut with Thompson and found another suitable song for a follow-up single and Late Freight, though not quite as addictive as the previous record, rode the groundswell of support they’d built and topped the charts as well. But the cupboard had soon run dry and since Thompson and Chamblee were not tied to one another professionally the magical interplay between the two was over almost before it began. 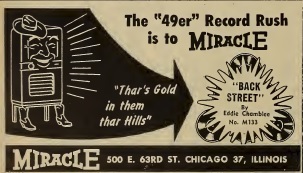 Though Miracle Records would coax Chamblee back into cutting a few more songs alongside Thompson in mid-1949 out of commercial desperation, the sax player had put together his OWN combo to take advantage of the notoriety he’d gotten for sitting in on someone else’s release, while Thompson did the same… both would then get their own releases on the label, something they surely hoped would result in two potential hit-makers rather than one. It didn’t work out quite the way any of them hoped, as Thompson’s popularity declined while Chamblee scored his ONLY hit under his own name with the somewhat suggestively named Back Street. We started off this review by hinting that Chamblee’s preferred style, rockin’ rhythm as he called it with an emphasis on the latter, a sound that had propelled both him and the rock instrumental to unforeseen heights in 1948 was in the process of being forcibly overtaken by a more rough hewn ostentatious brand of musical anarchy courtesy of a generation of increasingly less inhibited saxophonists. Chamblee was never going to feel comfortable fighting it out with that breed of musician and so what he needed was to keep defining “the groove” with his own efforts and hope that they were alluring enough to continue to draw interest in between the honks, squeals and snorts everyone else was laying down. But that was a slightly more difficult task to pull off all things considered. First off there was no way that these types of records would be as instantly ear-catching as the more explosive sounds of Big Jay McNeely and his ilk. Furthermore whereas even the most mediocre honking instrumental could often make the grade by merely substituting sheer effort and sweat for what they might lack in writing or arranging skills, the same was not true with the slower more seductive qualities required for Chamblee’s chosen material. These songs needed to contain a very specific musical components used with precision in order to connect. The melody had to be well written with a sense of progression that had you hanging on each note to hear where it took you next. The arrangement needed to make judicious use of the other instruments in the band to fill in the holes and contribute to the atmosphere of the song. Then the sax itself had to consistently maintain the right mood throughout the performance, a somewhat elusive formula that needed to feel intriguing, seductive, alluring and even slightly sinister without ramping it up so that it’d break that spell, yet also never easing up and letting the mind wander for so much as a second. You may not need to blow hot and heavy but the listener had to at least feel you were capable of it, that you weren’t some jazz expatriate out to bilk them of their 79 cents retail or even their nickel at a jukebox along with the two and a half minutes of their lives you’d be absconding with for duping them into thinking you were offering them up a rocker when in fact you merely skirting the edge of the form. 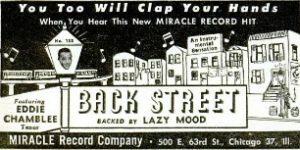 Back Street satisfies these requirements well enough to not have anyone demanding their money back or Chamblee’s head on a platter, but if you’ve been following along to the progression of the rock instrumental over the past year and a half you can’t help but think that this would’ve been a record more suited to the landscape of the spring of 1948 rather than the spring of 1949. Oh, it still fits all right, still makes for a pleasant way to pass the time, but a year earlier it all would’ve seemed much more fresh rather than slightly warmed over as it can’t help but sound now, when all of this has become somewhat old hat. (To that end, be aware that both Spotify and iTunes have only Chamblee’s late 1950’s re-recorded version of this song, done much faster with a more pronounced back beat… drums more than the handclaps here… which while not bad isn’t an improvement on the overall record as much as simply a modest update). Chamblee has the right idea here at least and everything falls into place well, from the isolated sax call that opens it, sounding restless and impatient, gargling the notes like someone clearing their throat upon waking in the morning, to the stop-time rhythm accents that are interspersed in this passage capped by the shouted cry of the title to insinuate a good time is about to unfold. It’s a well constructed opening, something that both is anticipatory of what’s to follow and yet has its own payoff contained within. Unfortunately it’s also arguably the highlight of the entire track as after that Back Street settles into a repetitious groove carried by the massed horns (Streamline Ewing on trombone and Goon Gardner on baritone) that while serviceable doesn’t contain the mesmerizing qualities it needs to keep you transfixed and obediently locked in. The tone is a little flimsy as Gardner isn’t given enough to do to keep the bottom heavy enough to make sure your shoulders move, none of which is helped by James Craig’s rather pedestrian tinkly piano backing them up. When Chamblee takes his first solo things definitely improve as he’s got some grit to his lines and the groove refrain eases into the background, now aided by light but steady handclaps to provide a semblance of a backbeat, though somebody probably should’ve awakened Chuck Williams the drummer and had him handle that job with his sticks. Without a solid base to build from Chamblee can’t help but seem less effective in what he does. The playing is okay, you can tell he’s trying to come up with some interesting passages, but they don’t really lead any place. One follows another, tenuously connected but without any real sense of purpose, no tangible feeling that this is really building towards something. Instead it just wanders, the whole thing sounding less like a shadowy scene found on a Back Street after midnight with desperate characters seeking their thrills and more as if it were somebody taking a leisurely afternoon stroll down the Main Street for the exercise alone. Only when they briefly return to the type of rousing call to arms they used at the opening do things pick up slightly as even the piano starts to get light bruises on its ivory keys, but before you know it the record ends and nobody has even broken a sweat, or the law. In spite of its conceptual timidity Back Street was a hit, albeit a relatively minor one especially compared to his work the previous year with Thompson. The record spent five weeks on the Billboard Best Seller’s Race charts, topping out at #10 for a lone week. It did slightly better on the Most Played Jukebox charts, as instrumentals usually did, sticking around for eight weeks and reaching #9 there. I’m sure everyone involved were reasonably satisfied with those results and probably felt that now that they’d firmly established Chamblee’s name independent of Thompson that the next time out they’d have a waiting audience to give his records an instant response that would propel them even further into the spotlight. Obviously that didn’t happen and that leads to the question of how closely any of them were paying attention to the trend setters as we rounded the turn towards summer 1949. Music moves along at a steady clip, especially rock ‘n’ roll, which unlike pop music of the time had a smaller but therefore more specialized market to satisfy. Whereas the sheer enormity of the pop realm and the nature of the conservative outlets who were all aiming to reach as broad a constituency as possible combined to effectively curtail radical experimentation and limited the impact a smaller niche audience could expect to have on the hit parade, rock was under no such restraints. The type of music itself was more daring by conception and in order to surpass what came before it each new record almost needed to take things one step further, or at least to find a new and more inventive formula to stoke the listener’s imagination. A year earlier the deep grooves of Thompson and Chamblee had done just that, replacing the more melodic and refined instrumental approach that was a carryover from jazz and big bands with something that sounded almost primal by comparison. Their efforts had been simple but never simplistic, giving off a sense of being urgent and alive which acted as a stimulus for the audience itself seeking something to latch onto and call their own. Of course it helped that the records themselves had the precise mix of components which proved to be highly addictive. But now a year later the response to that approach has already been absorbed and digested and trying to regurgitate it for another go-round isn’t going to elicit the same response, especially when the individual parts aren’t as inventive, as memorable or as good. It’s still just good enough to keep Chamblee in the running at least but no longer was it forward thinking enough for him to be setting the pace. It was also further evidence that the way to ensure you never get ahead of the pack in rock ‘n’ roll is to look back, even if what you’re looking back at was the image of yourself when you were rounding the turn heading into the summer of last year as the leader of the field. 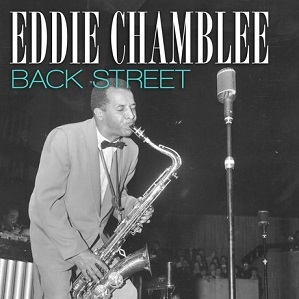 Leave a reply on "Eddie Chamblee: “Back Street”"